Dave James Miller, Sr., beloved son of Andrew and Pauline Perkins Miller, was born September 7, 1950 in Arlington, Georgia. Dave transitioned from this earthly world to be with the Lord on February 11, 2018. Raised in an agricultural family who had farmed and owned land for over 100 years, Dave learned quickly that hard work and dedication would be required to be successful. Life on the Miller farm instilled in Dave a strong work ethic, a keen sense of self-reliance and an independent spirit. Dave’s philosophy on work – forged by the rigor required of farming, – was summed up in his frequent quote to his children and others: “There are 2 working days after Friday and 2 working days before Monday – don’t be a weekend person!” In other words, work as long as you need to in order to get the job done! The eldest of nine children, Dave exhibited leadership at a very early age. His siblings recall that he did not hesitate to tell them what to do and to direct others on the farm. His wit and intellect emerged as a small child also. He was an honor student throughout primary school and until his graduation from Washington High School in 1968. His excellent academic record led to his acceptance and enrollment at Morehouse College in Atlanta, GA, where he graduated in 1972. While at Morehouse, Dave was a member of the Morehouse Maroon Tiger Marching Band and very proudly became an Omega man, pledging the Psi Chapter of Omega Psi Phi, Incorporated. Dave’s knowledge of economic development and economic parity increased through taking on progressively challenging positions with the City of Atlanta. He worked as Manager of Airport Development, Director of the Office of Contract Compliance and Director of the Bureau of Purchasing and Real Estate. As Director of Airport Operations, during the expansion of Atlanta’s Hartsfield-Jackson International Airport, Dave negotiated transactions valued at over $450 million annually. He also orchestrated the largest private-public land swap in the history of the State of Georgia at that time, involving 11 developers and 32 parcels of land; that land was valued at approximately $50 million and the development value exceeded $1 billion. Nationwide, Dave is considered a pioneer in the development of one of the most successful minority and women business enterprise programs in the country. After gaining extensive expertise and experience from working for the City of Atlanta, Dave co-founded D.J. Miller & Associates, Inc (now Miller³ Consulting, Inc.) in 1986, where he served as President and CEO for over 30 years. He was responsible for the overall management direction and development of the firm’s pursuit of airport and economic development initiatives and real estate projects. In 1988, Dave’s firm conducted the first Disparity Study, correctly anticipating the direction the U.S. Supreme Court was moving relative to Minority Business Set-Asides and goal-based programs. When the Court ruled in the case, City of Richmond v. J.A. Croson Co., that set-asides were unconstitutional and that municipalities had to provide a higher burden of proof for minority business inclusion, Dave’s firm rapidly became one of the most sought after in the country to conduct Disparity Studies to provide that proof. Dave participated in the company’s most recent major municipal study in 2017 despite experiencing health issues. The firm has been featured in publications like the Wall Street Journal and has provided services to municipalities not only in this country, but around the world where the commitment to economic inclusion exists. Throughout the firm’s existence, it has consistently remained one step ahead of the law and programmatic initiatives, pushing public entities to what Dave believed was the ultimate and only objective— a procurement system that is fair, open, efficient, transparent and inclusive. Although Dave left the family farm at age 17, his firm would later be commissioned by the U.S. Department of Agriculture to conduct a study to analyze the treatment of minorities and women in Farm Service Agency (FSA) programs and payments. The findings from this study supported a class action settlement that awarded Black farmers $4 billion. The Miller Farm was one of the recipients of the class action suit. Dave always had his eye on the future so it should come as no surprise that he brought his children into the business at an early age – having them to do things like make copies while in elementary school, data entry, answering the phones and performing other administrative tasks as they got older. Dave recognized the importance of exposure and ensured his children shadowed him and took notes during meetings to learn the business, as he quoted often “business is language”. Recognizing the power of their dad’s contributions and broad impact on society, his children are committed and determined to expand upon that legacy through continuing Miller³ Consulting, Inc.
Dave was involved in many community service projects but one which he treasured highly was the role he played in the start-up of the Dr. Ronald E. McNair Foundation after the Challenger disaster in 1986, which took the astronaut’s life. 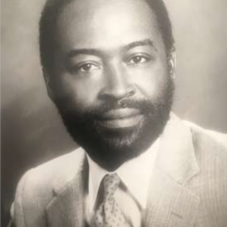 Working very closely with Dr. McNair’s brother, Carl McNair, Dave was instrumental in raising some of the first major funds for the organization, which focused on increasing the number of minority youth pursuing math, science and engineering careers. Dave also provided work space for the Foundation within his firm’s offices. Dave was also a founding member of the Airport Minority Council and instrumental in supporting the creation of several organizations focused on African-American political leaders.